I am using a grey font because it was a really grey day. It was never light really. It was snowing and pretty but it was grey. It was 34 degrees. Hmmm...Anchorage doesn't get super cold because it is on the ocean. I was reading that Barrows, Alaska has an average temperature of 10 degrees--and that includes the summer. Yikes. So I am going to put one more moose picture because although I look awful in it, it better shows just how close the moose got to me before it turned and walked away. 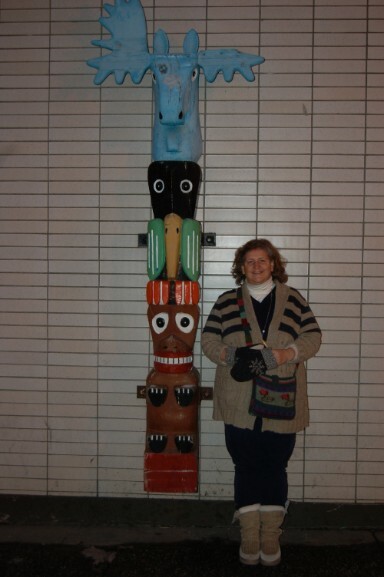 I am also putting on a couple goofy pictures we took--one of me standing by a fake totem pole--we will be creating totem poles of our own in January. Totem poles were like the winter count in that they were a way for the Native Americans to tell a story without words since they didn't have a written language. We will read the frog and the raven stories and look at the totem poles that tell those stories. And then there is our close encounter with a bear. Pretty funny. He used to be a real bear. I guess he still is, it's just that he's dead. The store claims he is the most photographed bear in Alaska. Maybe he is. Day 2 was foggy and dark but look who stopped by our hotel to visit. In the lobby was a sign that said, "Notice. Moose have been seen in the parking lot." Well, they were not kidding. The picture to the left is the baby. There is a momma too. Scroll on down to see more shots of our friends. They eat the bark or moss off the trees. See the white fence, that's wrapped around a tree to keep the moose away. Also, in the next shot, John didn't bother to tell me the moose were headed my way. He said he was wanting to take a good picture of me and the moose. I asked if he was afraid they'd bite me and he said it was a risk he was willing to take. After our close encounter of the moose kind we hopped in the car and headed down the Old Seward Highway (by the way, everything here is named for William H. Seward, the guy who bought Alaska from Russia. He's kind of a hero I guess. He was the United States Secretary of State under Abraham Lincoln.) We drove about an hour to the town of Girdwood where they have this ski mountain called Alyeska. This is a picture from the parking lot. At the very top of the mountain is a chalet that we rode up to on a gondola. Check out some of the awesome shots we took. It was an amazing view!! I would NOT like to ski here but everyone else in my family would LOVE it. And thus ends another amazing day in the final frontier otherwise known as Alaska. Son #3, Joe, is spending a semester at the University of Alaska, Anchorage. Check out this shot of an inlet from the Pacific Ocean at the Alaska Bay and the Chugach Mountains. It is incredible. Look at the sunlight filtering through the mountains and shining on the icy water. This is about 5 miles southeast of the city of Anchorage on the way to Seward. We might go to Seward tomorrow. We wanted to take the train but it is $150 roundtrip per person and there are 3 of us so it is too expensive. We rented a car for only 14 bucks a day so...no brainer, we'll drive. Here are John and I on the bridge that Joe crosses every day. That is his dorm behind us. The campus is in front of us. It's actually a several block hike from here. Below I have some more pictures of the mountains and the water. Joe took us to this cool wayside park on HWY 1, Old Seward Road. It takes only a minute to get there. I am keeping my eyes open for a moose. Today we saw some mallards and other ducks and a bird I've never seen before but no moose. Well, we went into a store called Anchorage Fur Exchange and Joe tried on a $500 hat that is fox fur with the fox head still attached. Maybe we'll go take his picture in it. Not gonna buy it. They had many real furs and things made from furs. **Here's the crazy part--it didn't get light until 10:30 this morning. But no worries, by 3:30 it started getting dark. The picture with the sun going down behind the mountains was taken at 3:00. Isn't that crazy! What a short day. **Check out Joe's shorts, boys. I think we should just declare him the winner of the shorts contest and move on. What do you think? How will you top shorts in December in Alaska. Joe wins! **We got our luggage back, all our clothes are here and we are set. We toured the school and walked a bit in the mountains, all in all a successful first day.